Published in VAULT: Australasian Art & Culture, Issue 7, 2014. When it comes to fashion publishing, Julie Anne Quay is no slouch. The New York-based Australian has executive directed VMagazine, casted runway faces for Marc Jacobs, held editorial posts at Vogue Australia and Vogue Japan, not to mention clocking in six years managing the studio of iconic photographer Steven Meisel. Several years ago, after noticing the rate in which the public flocked online to source fashion ideas, forecast trends, and to shop, Quay decided to leave print publication to develop a vanguard social media platform devoted to all things fashion and style. VFILES (short for ‘virtual files’) started off in September 2012 with an impressive digitised library of VMagazine and VMan issues, available online for free. Quay and her team also introduced an online shop featuring high-end and rising labels, and produced a series of street-wise video shows that championed – and sometimes satirised – the industry. Obvious formula to success seeing as VFILES has become staunchly community-driven and currently attracts 1.4 million page views per month. Here, fashion designers, models, stylists and fashionistas are able to upload, archive and swap images, curate styles and lookbooks, test-drive creative concepts and launch a fashion range. Aspirers are invited to submit original designs for a chance to show at VFILES MADE FASHION during New York Fashion Week, with VFILES known to hand-pick people from its online community to appear in campaigns and films. It’s Quay’s way of democratising fashion in the digital era by giving citizen users a global stage to identify and digest fashion in their own terms. VAULT caught up with Quay to talk about her career highlights. WHAT WAS YOUR ETHOS FOR ESTABLISHING VFILES? 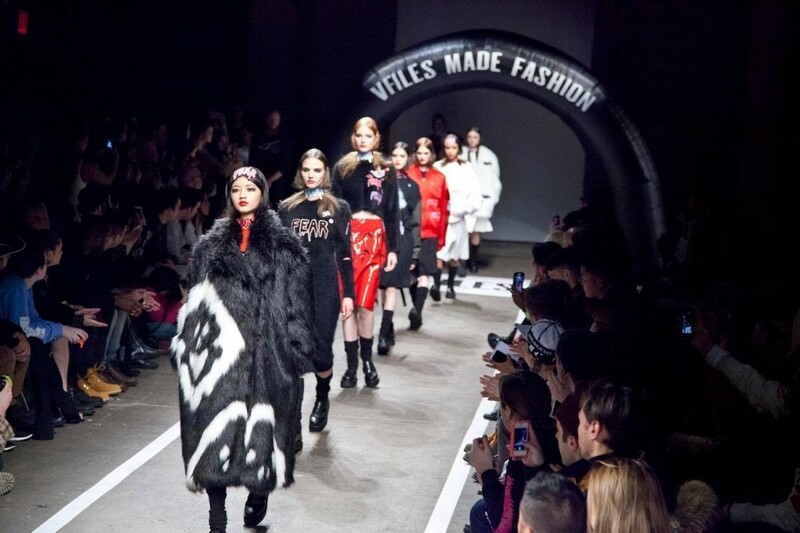 VFILES is a next generation fashion community. We felt there was a need for a democratic fashion environment where we could hang out online, share ideas, entertain and be entertained, and buy things. HOW DO YOU PLAN ON EXPANDING THE VFILES EMPIRE? WHAT CAN WE EXPECT TO SEE IN THE NEAR FUTURE? I love that you refer to it as an empire!! We will be two years’ live in September – still working out who we are, as everyone is! But we know where we want to be: more global, more users, more functionality, more fashion. We will have our third season of VFILES MADE FASHION this September, and its gearing up to be our best one yet with tons of new designers uploading profiles every day. Recognition is really starting to pay off for previously-featured designers who are now having major impact on the global fashion scene. It’s great to be able to foster that. Also, we are working on some broader projects that include Film and Television – what can I say, we are obsessed with media – as well, and we are expanding our VFILES SPORT PLUS line, our mobile and our VFILES game, which is really fun. Our plans for expansion really involve organic growth from the ground up by continuing doing what we are doing, and doing it better and better, and making more and more friends. AS THE FORMER EXECUTIVE DIRECTOR AT VMAGAZINE AND FASHION EDITOR AT VOGUE AUSTRALIA, WHY DID YOU DECIDE TO TACKLE THE DIGITAL ARENA WITH VFILES? AND WILL YOU EVER GO BACK TO PRINT? I don’t think I will go back to magazines as they exist now per se, but I still believe in printed images and the tangibility of them. I am just too impatient to wait for a great shoot or a great story to be released in print. VFILES exists in the digital media space because honestly that’s the media space that matters. IN 1993 YOU RELOCATED TO NEW YORK CITY, WHERE YOU AND YOUR HUSBAND ARE CURRENTLY BASED WITH YOUR TWO SONS. HOW WOULD THIS HAVE COMPARED TO FAMILY LIFE IN MELBOURNE? NYC is different and the same. There’s something to be said about bringing up kids in a place with incredible museums, vibrant culture and energy – but there’s also something to be said about Australia’s backyards, bikes, beaches and BBQs, and the families that we miss. So trying to combine both has been our goal, and I think our kids are pretty international because of it. WHAT WAS THE EXPERIENCE LIKE DURING YOUR EARLY YEARS IN NYC? First few years were amazing and some of the best of my life. My number one takeaway? ‘Fashion is a team sport and always will be’. I also realised there are huge opportunities for Australia and Australians in fashion and media, and we should step up and take advantage of them. YOU WERE INSTRUMENTAL IN THE FORMING OF THE AUSTRALIAN FASHION FOUNDATION AND THE AUSTRALIANS IN NEW YORK FASHION FOUNDATION. CAN YOU TELL US WHAT PROMPTED THIS? I came to NYC pregnant, with my husband and two suitcases – it was a tough but exciting transition personally and professionally. NYC is a challenging place and so competitive, and I wanted to be able to support other young Australians who decide to come here, so Malcolm Carfrae and I decided we were going to set up a foundation and do it. We are so proud of what we have achieved and of the young Aussies that we have been able to bring and support here. Calvin Klein, Alexander McQueen, Narcisco Rodriguez, Thom Browne and Craig McDean are some of the biggest names in fashion that have supported our program; and of course the Australian Wool Corporation. SO WHAT IS IT ABOUT AUSTRALIANS THAT MAKES THE WORLD TAKE NOTICE? It’s our sensibility that matter: our love of people, life, light, freedom, space, and our ability to ‘keep on keeping on.’ Going home regularly keeps us on point. I don’t really think you can say Aussies have a work ethic – I mean we are from a country where people surf before and after work – it’s more that we have a passion and determination to succeed in our chosen fields that separates us. Sometimes it’s about being naïve enough to believe in ourselves when others wouldn’t. THERE CONTINUES TO BE A SURGE OF SUPERBLOGGERS USING SOCIAL MEDIA TO DRIVE TRENDS AND ELEVATE BRANDS. WHAT ARE YOUR THOUGHTS ON THEIR ABILITIES TO TURN A FIXATION ON FASHION AND STYLE INTO A MARKETABLE CAREER? Fashion bloggers were the early adaptors of internet fashion. It used to be that editors didn’t know how to use their computers or their blogspots, and that was the niche that bloggers stepped into. That gap is closing now that most major magazines and journalists are more internet-friendly. So that space is about to become way more competitive. YVES SAINT-LAURENT ONCE SAID THAT “A GOOD MODEL CAN ADVANCE FASHION BY TEN YEARS.” HAVING WORKED IN THE FASHION INDUSTRY FOR OVER TWO DECADES, WHAT DO YOU LOOK FOR WHEN CASTING AND COMMISSIONING TALENT? Great quote! When casting or commissioning talent I look for the same thing I do when hiring people for any job: energy, passion, obviously a fit for the project, but most of all enthusiasm. Enthusiasm is so under rated – it’s the one thing that separates the A people from the B. Image: Hyein Seo, New York Fashion Week 2014, VFILES MADE FASHION. Courtesy of VFILES.